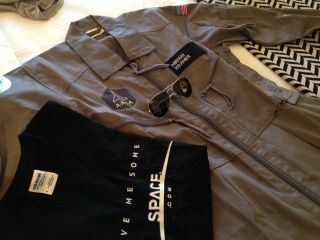 SPACE.com staff writer Miriam Kramer's flight suit for the AXE Apollo Space Academy. Image uploaded Dec. 4, 2013. CAPE CANAVERAL, Fla. — Things are about to get extreme. I flew down here to Florida Wednesday (Dec. 4) to cover the AXE Apollo Space Academy, a space camp designed to give away 23 tickets to space. The 109 recruits from more than 60 different countries hoping to win one of those coveted tickets came to Florida earlier in the week to train like astronauts, and I'm about to join them. The astronaut hopefuls with the Axe Apollo Space Academy are being run through the ringer in a g-force simulator, air combat training in real fighter jets and Zero-Gravity parabolic flights that allow them to feel the effects of weightlessness. The people at AXE have outfitted all of the recruits and media participants with flight suits that act as our uniforms for each training mission. Miriam Kramer is visiting Florida with the AXE Apollo Space Academy team on a trip partially paid for by AXE.